In the book Richard Burton Prince of Players – in the chapter “Lust and Life at 20th Century Fox”, there is this paragraph where the author recalls Richard Burton telling him that one of the pleasures of making The Robe was working with Victor Mature. 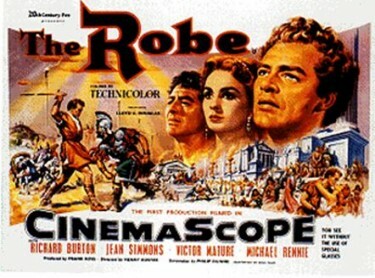 Above – Victor Mature in The Robe kneels before the cross. Another Story about Victor Mature – The film composer, William Alwyn, used to tour film societies showing a clip from a western, in which Victor Mature played a settler who had just found his family massacred by Indians. The director, according to Alwyn, had spent multiple retakes trying to conjure grief from Mature’s rocklike expression. The actor became the joke of the set. However when the film was previewed, audiences during the scene in question wept. “That man knew something about film acting which we didn’t,” Alwyn said. 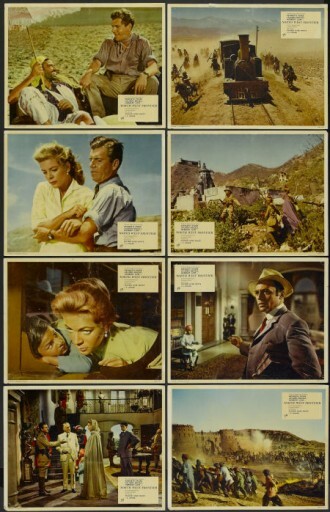 This is British Cinema at it`s best, a rousing Northwest Frontier picture with all the right ingredients, lots of ‘goodies’, a real ‘baddie’, and a dashing hero, with a fiesty female lead in the form of Lauren Bacall. Things do pile up on the characters in the old train as it goes from place to place in an effort to save a young Prince, but things never go over the top, and the acting is first rate, as well as the direction. 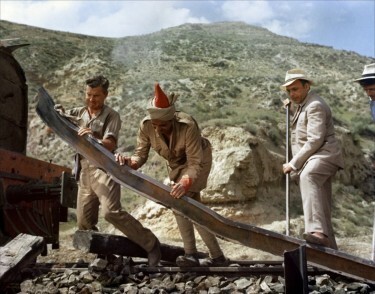 Kenneth More, as always, is top rate, also note worthy is I.S.Johor as the train driver, Wilfred Hyde White as the British Diplomat, and Herbert Lom as as bad a baddie as l have ever seen him…. A young prince who is the sole survivor of a massacre that includes his family escapes a revolution with the help of Kenneth More and a band of supporters – at least we think so. Their means is an old steam engine and a short train of wagons and carriage. With this, they run a blockade and must escape from the ‘Northwest Frontier’. Set at the turn of the (20th) century, Kenneth More is, as usual cast as the thoroughly decent and honourable Brit. The cast in a shrewd mix of popular characters. Lauren Bacall provides an unlikely American love interest for More as the boy-prince’s governess. Wilfred Hyde-White does a great dithery bachelor inclining to old-age. 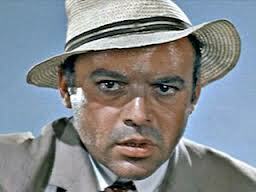 Herbert Lom is a mixed-race reporter and Eugene Deckers does well as an arms dealer. Ursula Jeans is the modestly authoritative MemSab. I always remember the first time I ever saw the film at the cinema on the big wide Cinemascope screen, the scene where the main characters are very high up on a broken bridge and have to walk along a single rail line which is still intact – and the prince has to do this with that enormous drop below – and waiting to catch him is Herbert Lom, who we just know by that stage is not exactly a force for good. I S Johar turns out to be the most appealing character playing ‘Gupta’ the Indian engine driver, with humorous and sympathetic panache. Along the way, there are adventures. But no less entertaining is the spirited dialogue between the passengers, each of which has a conflicting or complementary viewpoint as the conversation waxes. Although a tongue-in-cheek adventure movie, it doesn’t shy away from the darker elements of human nature. These are explored in the intelligent dialogue, but exposed in the circumstances too. At one point, they encounter an earlier train which has been intercepted by bandits. Everyone aboard has been slaughtered. It is very simply but grimly presented. No needless gore; just a sad pensive silence broken by the buzzing flies and caw of vultures. Herbert Lom’s character isn’t the impartial observer he pretends to be because he sympathises with the insurgents, and means to murder the boy himself if he can. 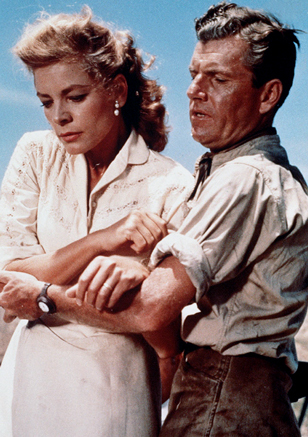 The movie is beautifully filmed, with great vistas of wilderness and excellent colour. Train-spotters will enjoy the railway details. This is highly recommended family viewing that – like so many of those 50′s adventure tales - it is great fun !!! Great actors, good script, fine views, bags of excitement, a villain in the party and moral messages. What more do we need from a movie? Doreen Hawkins, who has died aged 93, was a member of an Ensa unit which toured the battlefronts of Africa, India and Burma during the Second World War; after the war she married her glamorous boss, Col Jack Hawkins, who would become one of Britain’s most respected actors. She was born Doreen Mary Beadle on July 13 1919 in Southampton, where her father, an unsuccessful businessman, devoted much of his time to amateur dramatics. After making her stage debut aged four at the Misses Bird’s Dancing Academy’s annual matinee at the city’s Grand Theatre, she went on to take children’s parts in productions there. She began her professional career at the age of 15 when she landed the part of a flirtatious teenage girl in a play touring the north of England. From then until the early years of the war she appeared in rep around the country under the stage name Doreen Lawrence while falling in and out of love with mostly unsuitable young men. Aged 16 she met the future horror film star Peter Cushing and was immediately smitten with his “splendid profile and dark wavy hair”. They became engaged shortly after her 18th birthday, but the relationship took a bad turn when, during an argument at a restaurant, he threw a plate of spaghetti in her face and burst into tears. The engagement ended after a tearful and embarrassing confrontation at Waterloo station, with Cushing’s parents in attendance. To console him, she recalled, his father gave him money to go to Hollywood, so “without either of us realising it at the time I had given him the chance he needed”. In 1940 she married a stage manager at the Sheffield Lyceum who had already been called up for military service. The marriage began badly when, during their wedding night, air raid sirens forced them to evacuate their room at the Grand Hotel in Sheffield. They spent the rest of the night sharing a bottle of Scotch with the tenor Richard Tauber. With her husband away in North Africa, in 1942 Doreen signed up for the Entertainments National Service Association (Ensa), joining a queue of “strange folk, jugglers, dancers, actors”. After touring RAF bases in East Anglia, in 1943 she joined the Indian Repertory Company — the first acting troupe to be sent abroad to entertain the forces. At Liverpool they embarked in a troop ship, which zigzagged down the Atlantic to avoid the U-boats, stopping off in Freetown, Accra, Lagos and Durban. From there they travelled by boat, lorry and train to Cairo, where she had a traumatic reunion with her husband, who had turned into a drunken bully of an Army officer. The marriage, she decided, was over. Nine months after leaving Liverpool her troupe arrived at Bombay, on New Year’s Day 1944. For the next two years, with the help of professional actors lent from the forces, they toured cities and battlefronts in India and Burma, including war-ravaged Kohima and Imphal, putting on Noël Coward plays in hospitals, tents and barns. The war was a good time for the profession, and Doreen often bumped into the likes of John Gielgud, Joyce Grenfell, Edith Evans and Gracie Fields, “who sang her heart out with that powerful voice and no microphone”. The ubiquitous Noël Coward “only needed a piano and would go anywhere to entertain the troops and improve morale”. 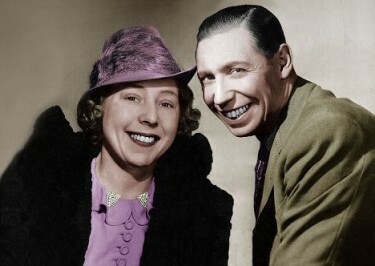 Rather less popular was George Formby — or rather his wife Beryl, who insisted on top hotels and star treatment. 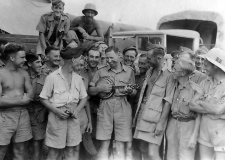 George Formby and Beryl entertained the troops. For Doreen and her companions life was less luxurious as they lugged their props and scenery in the heat and humidity and spent interminable hours hanging about at railway stations. Malaria and dysentery were constant hazards, and Doreen was grateful if her sleeping quarters had a roof. Rangoon, recently vacated by the Japanese, was swarming with rats grown fat on human flesh, and she was warned not to use the lavatories as the Japanese had booby-trapped everything they had not had time to smash. The troupe fled their sleeping quarters in a disused nightclub when monsoon rains came pouring through the roof; and Doreen had to beat a hasty retreat from a nearby lake, where she had gone to bathe, after being informed it was “full of dead Japs”. She had first set eyes on Jack Hawkins in Bombay, where he “appeared as a shining hero to reorganise and redirect” her troupe. As she toured the subcontinent they continued to meet regularly. On one occasion, when acting the part of a secretary away with the boss for a dirty weekend, she persuaded Hawkins to step in as the “boss” when the actor who usually played the role was indisposed. They fell in love, but as Doreen was still married and Hawkins was in the process of getting divorced from his first wife, the actress Jessica Tandy, they were unable to get married until after the war. When Doreen returned to Britain in 1946, she faced a freezing winter and a divorce suit. But after three years away she was a different person from the ingénue who had left England in 1943. She rented a flat near Covent Garden and resumed her life as an actress. In 1947, after her divorce came through, she married Hawkins. She gave up her career to devote herself to her husband and their three children. They bought a villa near Cap Ferrat where they enjoyed happy family holidays. In 1957 they revisited old haunts when Hawkins co-starred in The Bridge on the River Kwai, which was being filmed on location in Ceylon. Doreen recalled his amusement when, from their bedroom in a jungle hut, they heard, in the next door room, the producer Sam Spiegel trying to bed his girlfriend, and being brusquely rebuffed. Doreen was in her mid-40s when, in 1965, Hawkins was diagnosed with throat cancer. She nursed him devotedly until his death in 1973, aged 63. Though she continued to enjoy a glamorous life, in her memoir she admitted that she had never recovered from her loss. Drury Lane to Dimapur (2009), above. ‘Youthful’ is the first word I would use to describe Doreen Hawkins’ memoir ‘Drury Lane to Dimapur’. This is perhaps surprising as its author is all but 90 years old. Subtitled ‘Wartime adventures of an actress’, it follows her life high-spiritedly from her first stage appearance at the age of four, through her time as an enthusiastic teenager in the flourishing weekly repertory theatres; from there to a hasty ill-starved marriage after the outbreak of war and a period as an ambitious hard-working actress performing amidst the blitz and the blackout. Association or, according to Tommy Trinder, Every Night Something Awful. This brings us to the main body of the book – describing Doreen’s travels to, among many other places, West Africa, South Africa, Cairo, India and Burma. In the course of this lengthy and arduous tour (1942-46) she had a stormy reunion with her much-charged husband now a drunken bully of an officer. Their short-lived marriage unsurprisingly collapsed. Subsequently in Bombay Doreen met Jack Hawkins, later to be a major film star but already an established stage one in charge of ENSA in the Far East. Their mutual falling in love is very convincingly described. After a harrowing time in war-devastated Burma and a further engagement in India Doreen returned to austere post-war London. She faced a freezing winter and an acrimonious divorce suit. Undaunted she rented a cheerful bohemian flat near Convent Garden and resumed life as an actress on home territory. At last she was granted a decree absolute and was free to marry Jack Hawkins. She gave up her acting career as his flourished more than ever. Even if this book had been a duller one, it would have been well worth writing. It gives a uniquely detailed documentary account of life in a war time entertainment company of which fewer and fewer people can have first-hand memories. Doreen Hawkins memory is quite simply phenomenal; her story far from dull. It is romantic, often drily humorous, also dramatic, moving and at times horrific with near-death, illness and nightmare journeys on primitive trains and packed troopships; war continually raging in the background. Doreen herself seems an admirable character – starting as an exuberant stagestruck girl, briefly engaged to an equally exuberant Peter Cushing. She inevitably matures with her marriage breakdown and gruelling wartime experiences but seldom complains and never loses her wide-eyed curiosity. From her brief comments on her craft, I imagine she was a charming, skilful light comedy actress; her company providing sparkling entertainment for exhausted and wounded troops. Her eye for detail is outstanding – whether describing revolting food or glamorous clothes. Her unpretentious writing brings past events back to life as fresh as if they had happened yesterday.